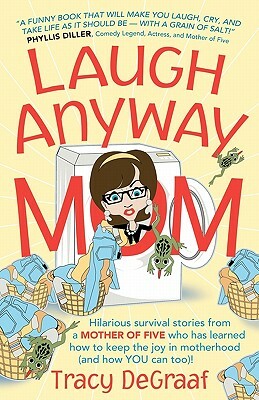 Laugh Anyway Mom is a hilarious book by veteran mother of five, Tracy DeGraaf. It is filled with laugh-out-loud stories that are sure to resonate with every mom This book will make you laugh and cry as Tracy reminds you how to keep your sense of humor and to reconnect with the true joys of motherhood. Tracy DeGraaf is an author, speaker, humorist, stand-up comedian, entrepreneur, and mother of FIVE who inspires people to LAUGH ANYWAY and make the best of every situation, no matter what! Her dynamic and entertaining presentations bring a positive and inspirational message to each audience. She encourages people everywhere to embrace life's rewards and life's challenges with a hope-filled perspective. And, she does it all with a sense of humor! Tracy has a bachelor's degree in journalism from Illinois State University. She has been trained at The Second City in Chicago, and has been called "The Queen of Mom Comedy" when performing stand-up. She is a small business owner and has years of experience as a top manager in the direct selling industry. The DeGraaf family lives in the Chicago area. Tracy is available as an emcee and she conducts keynote presentations, workshops, break out sessions, and stand-up comedy, for events at colleges, churches, non-profit organizations, direct sales companies, and corporations. To contact Tracy for further information about her books and additional products, or to schedule her for a presentation, call 708-691-5091.